Peter Jackson’s final (?) film set in J.R.R. Tolkien’s fantasy realm of Middle-Earth is as gorgeous and spectacular a send-off as any fan could have hoped for. If The Hobbit: The Battle of the Five Armies truly is to be audiences’ final adventure in the lands of Middle-Earth with director Peter Jackson as their guide, then he certainly delivers one heck of a farewell tour. 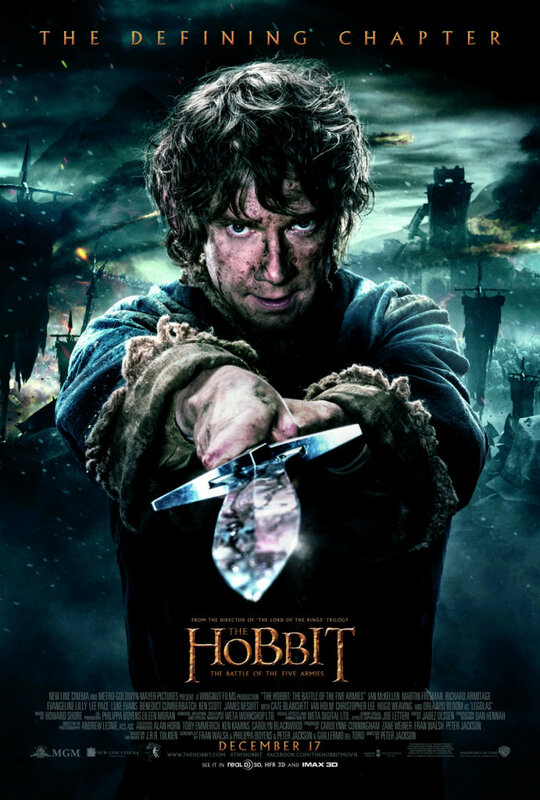 Full of memorable performances, thrilling battles, and tons of heart, Five Armies is easily the best of the three Hobbit films, and should satisfy even the most ardent of Tolkien devotees who have been critical of Jackson’s “Hobbit” trilogy since the opening chapter hit theaters in 2012. Five Armies picks up precisely where last year’s The Desolation of Smaug left off, with the fearsome dragon Smaug (once again voiced and depicted via motion capture by Benedict Cumberbatch) bearing down upon the human village of Lake-Town, intent on punishing the people there for helping the dwarven Company of Thorin Oakenshield (Richard Armitage) in their quest to retake their ancestral kingdom of Erebor, which Smaug had himself taken from the dwarves a century and a half before. As was foreshadowed in the last film, it falls to Bard the Bowman (Luke Evans) to save Lake-Town’s people from Smaug’s wrath, and then to lead them to shelter and safety in the aftermath of Lake-Town’s destruction and in face of new threats. Meanwhile, with Smaug gone from Erebor, the dwarves and the hobbit Bilbo Baggins (Martin Freeman) are faced with a new problem. Just as his grandfather Thrór did before him, Thorin succumbs to “dragon sickness” once he claims all of the gold the dragon had hoarded during his occupation of the mountain kingdom. Reclaiming the crown and the title of “King Under the Mountain”, Thorin goes back on his earlier promises and rebuffs the claims of Bard and the Elvenking Thranduil (Lee Pace) for part of the dragon’s hoard, and prepares his tiny company to fight to the death against the army of well-armed elves and Lake-Town survivors laying siege outside Erebor’s gates. Before long, that army of Men and Elves are confronted by an army of dwarves lead by Thorin’s cousin, Dáin Ironfoot (Billy Connolly), and war between the Free Folk seems unavoidable despite the efforts of Gandalf the Grey (Ian McKellen) to warn the armies’ leaders of the greater threat facing them all: the two separate armies of goblins and orcs from Moria and Gundabad led by Thorin’s orc nemesis Azog (Manu Bennett) and his powerful son Bolg (Lawrence Makoare). Got all that? Well, if you’ve been watching these movies consistently as they’ve each made their bow in theaters, it’s certainly easier to follow. Even if it isn’t, just keep loose guidelines such as Men/Elves/Dwarves all basically good but greedy, Orcs/Goblins very, very bad, and Hobbits almost immune to avarice in mind and you’ll be fine until the film’s spectacular battle scenes begin, at which time it really doesn’t matter, anyway. Of the three “Hobbit” films, Five Armies is perhaps the one that feels the tightest in terms of pacing and the necessity of the story material audiences are given on screen. Whereas Smaug last year felt at times belabored and overwrought with underdeveloped characters and storylines, Five Armies moves at what feels like a breakneck pace as it goes about paying off all those elements left unfinished in the first and second films as well as setting the stage for the climax of the entire trilogy. It’s as quick a two hours and thirty minutes as you’re likely to experience in a movie theater, which is about as polar opposite an experience as is possible from the experience of watching Smaug, which moved in fits and starts for almost two hours before it really hit its narrative stride. A strange but understandable by-product of all those subplots getting resolved and supporting characters getting their due is that this film has the least amount of focus on its titular character, Bilbo. If anything, the film really belongs to Thorin, and to a slightly lesser extent Bard, who each rise from difficult circumstances and overcome tremendous hardships in becoming leaders for their peoples in the final battle. But that transition away from Bilbo to those other characters really began in the previous film, and so the prolonged focus on them here feels organic to the progression of the whole tale. It helps a great deal that both Thorin and Bard are played with charisma and weight by Armitage and Evans, respectively, else the shift away from Martin Freeman’s ever-charming portrayal of Bilbo might feel more intrusive. Fans of Bilbo Baggins and hobbits in general, fear not, however; this story began in the Shire, and rest assured that it ends there, with a final beat that should put a smile on the face of anyone who fondly remembers The Lord of the Rings Trilogy of a decade ago. In regards to the film’s production design and special effects, at this point heaping yet more praise upon the digital effects wizards at WETA for their efforts just feels redundant. Indeed, had what they given audiences here not been at least the equal of what we’d seen before, then it might be more worthy of mention. But no, the armies of Middle-Earth’s disparate races, the great dwarven halls hewn from the rock of the Lonely Mountain, the ruins of the once-great city of Dale and the terrifying fortress of Dol Goldur have never looked better than they do here, and should earn at least some consideration next year for Oscars in the technical categories. It’s all a feast for the eyes, particularly if seen in 3D — if you’re particularly selective about the films you’re willing to spend the premium at the box office for a 3D show, have no fear that this is one that earns your every penny. That said, is there bound to be an “Extended Edition” of the film that’s at least 30 minutes longer released on DVD and blu-ray around this time next year? Absolutely. Should you then wait to see The Hobbit: The Battle of the Five Armies until you can bring it home in the “definitive” version that Peter Jackson would no doubt prefer you see? Absolutely not. Waste no time in taking this one, last thrilling trip to Middle-Earth and saying your goodbyes to Bilbo, Gandalf, Thorin’s Company, Galadriel, Lord Elrond, Legolas, and the rest. That way, you can enjoy all the more getting to see it all again and then some once you can watch it unfold in your living room. Starring Ian McKellen, Martin Freeman, Richard Armitage, Evangeline Lilly, Lee Pace, Luke Evans, Benedict Cumberbatch, Ken Stott, James Nesbitt, Cate Blanchett, Iam Holm, Christopher Lee, Hugo Weaving, and Orlando Bloom. Directed by Peter Jackson. Rated PG-13 for extended sequences of intense fantasy action violence, and frightening images.